Maybe a group critique of the science will be in order after the series concludes? Not so much the science as the various administrative decisions made which jeopardized the entire settlement/base? There are definitely some lessons to learn from the show, in spite of my somewhat negative comments. Videos on YouTube are being taken down due to copyright infringement. I searched for new videos on YouTube, but how long will they remain? So perhaps I should continue episode synopsis. This episode is all about surviving the global dust storm. Solar panels don't provide power, just nuclear. And some nuclear reactors are "off line" due to power cable upgrade that was not completed. Power to the greenhouse is insufficient, and base commander informs the individual running the greenhouse that she has to ration power. That means reducing power to the greenhouse further. The agronomist is depressed that his hybrids are dying. Base commander is critical of the individual who proceeded with the cable replacement against her instructions. Not a big confrontation, just a side remark when informing the agronomist. Other crew members have "cabin fever". The power cable specialist feels shunned, people don't even look at her when passing in the hall. The power cable specialist is wife of the agronomist; the only married couple. This is creating strain on their relationship. The dust storm generates lightning. A lightning strike takes a junction box, taking out power. The episode started with the mission commander stating they were running on reserve power, with no margin. If anything happens, they're in deep trouble. Foreshadowing. They manage to get the base computer with voice interface back online. They're running on battery power, temperature dropping 3°C every hour. Several crew members volunteer to go out in the dust storm to repair the lightning damage. Base commander doesn't want anyone out in the dust storm, but the volunteers offer to use the rover. And they need power for life support. One of the repair crew is from Africa, describes a dust storm from the Sahara obscuring everything. More foreshadowing? Discussion of dysfunctional crew members, not handling isolation in extreme environments. The rover has to stop short of the cable due to terrain. The crew member from Africa goes out in a suit, to the end of his tether and still can't see the cable. Unclips, walks into the dust. Is he lost? Dramatic scene. But he finds the cable, follows it to the junction box. Can fix it. At the end of the episode, the storm passes and sunlight shines. Like clouds parting. The base is built on a plateau of rubble beneath a "skylight" in the lava tube, so sunlight shines onto the base. Crew rejoice. However, the agronomist looks around at all his dead plants. He visualizes being in a cabin, and outside is a green field and a sunny day. He had drawn that cabin in his notebook, his wife finds it in their quarters. He walks over to the air lock. Security watching monitors sees this. His wife sees this, runs to the greenhouse. Mission commander orders a pressure door sealed to close off the west wing. The agronomist's wife doesn't make it to him, just to the wing pressure door. She has to seal the door, people are still inside that wing. The agronomist opens the door, depressurizing the greenhouse and the entire wing. As an aside--the Power Specialist and Agronomist seemed to come across as being problematic in Episode 4--"foreshadowing," again. There were already indications of the mental instability of the Agronomist in that earlier Episode, as well. The Power Specialist also came across as a "know-it-all-know-better-than-thee" individual. As foreshadowed, it didn't end well. Another week, another episode. This one is sadness, crew members in spacesuits enter depressurized modules. Move fallen equipment from dead bodies. The agronomists wife morns. They salvage parts from the surface workshop to repair damage to decompressed modules. They don't say what parts they need or why. Politicians and investors on Earth demand end of the mission. Those on Earth point fingers over dead crew members. They go back to the rocket, restart systems in preparation to return to Earth. Don't ask me how; if you remember the first episode, the rocket required propellant produced by pre-landed equipment. They landed 75.3km away. No mention in this episode of propellant. The rocket is covered with Mars dust, they say it looks like it's been through war. But internal systems do start. Discussion of Apollo 13. They claim Apollo 13 spooked Nixon. Space shuttle was "small steps" instead of a "giant leap". But people were disappointed the space program went nowhere. Zubrin said Apollo is still in living memory, but fading fast. Back to the show. While salvaging parts from the surface workshop, they find something encrusting heat sink fins in the water condenser. A scientist (the medical doctor) takes samples. They study it. The agronomist's wife talks to the medical doctor studying the samples, and describes a joint work project with her husband. He had found a correlation between wind patterns and spread of the disease. So the Mars medical doctor studies wind patterns of the Mars dust storm. She can't find the source of whatever encrusted the heat sink, but can find where it went. They find another sample. In the lab, under a microscope, they find a living fibrous microbe. The UN envoy was going to announce the end of the Mars mission. But instead announces they found life on Mars. Cheering. Fade to black. They also claimed Saturn V was far too big to go to the Moon. That Von Braun was actually preparing to go to Mars. I challenge that claim. There was discussion of Earth orbit assembly, but NASA really didn't want to do that. In 1960 and 1961, NASA tried to design a mission to launch a CSM directly from Cape Canaveral to the surface of the Moon and back to Earth. The problem is every time they tried, the numbers said they needed a rocket even larger than Saturn V. It was only when the manufacturer of the LM convinced NASA that LM/CSM stack would reduce launch mass that they were able to fit Apollo on Saturn V. These claims that Saturn V was too big for the Moon are based on modern orbital assembly ideas. Yes, a lunar stack could have been assembled in parts, launched with Saturn 1B. But they didn't have orbital assembly technology back then. Would-a could-a should-a, but they didn't. As an overall effort--disappointing. If I were a professor and giving it a grade for scientific/engineering accuracy versus the "dramatic impact," it would come in with a C-. Very illogical in many instances. Not that the equipment or engineering was all THAT bad, but the management and human interactions were too uncontrolled, and that being done remotely from Earth by the investor team. Just my somewhat caustic comments. Feel free to correct me if I'm wrong. Disasters show raise a few issues we really need to prepare for. 1) If a module decompresses, it doesn't have to be disaster. Someone could quickly get in a spacesuit, go through an airlock to the outside, then run over to the open door of the greenhouse module. Grab the agronomist, pull him inside, then close and seal the pressure door. Once sealed, use emergency pressurized air to repressurize all modules. Contrary to Hollywood, humans do not die instantly from decompression. In fact, death from decompression is so slow that you'll die from asphyxiation first. How long can you hold your breath? That's how long you can survive in vacuum. If a crew member is exposed to the soft vacuum of Mars atmosphere, then pressure and oxygen restored, they will survive. They will have deep tissue damage, starting with lungs, nasal passages, and eyes. It'll take a couple months of convalescence to recover, but crew members can recover. That's better than dead. 2) Why did the entire wing decompress? Each module should have its own pressure door. Modules for ISS do. So decompression should have been limited to the greenhouse. There were people in the lab module, they could have closed the door to the greenhouse as easily as the door to the rest of the base. 3) Repairs outdoors during a dust storm demonstrates the need to deal with that. Infrared (IR) cameras can see through dust. Mars suit helmets need a display system that can display results from an IR video camera. You could call this "synthetic vision". Military night vision goggles used to use IR; I'm told they now use light amplification so starlight is enough. But astronomers use IR to see through dust clouds; that's how they can see stars in the centre of our galaxy. An IR helmet system should allow astronauts to see in a dust storm. 4) They also need some sort of homing beacon. A radio something, a device the size of a smart phone could display direction to the rover. Or the base. Before smart phones came out, when we just had PDAs, I said a device the size of a PDA strapped to the forearm of a suit would provide controls to the suit. That device would also be used as a data logger; to record time, location, and context for each geological sample taken. A system of Wifi repeaters, each with a solar panel and battery, would extend the base network to the surrounding terrain. That would provide VOIP for instant voice communication, as well as internet access to servers in the base. Those repeaters could also provide high precision location for recording geological samples. It would use the same principle as GPS satellites, but on a much smaller scale. Once that is established, you can display a map of the area with an icon showing your current position, and orientation to real features/facilities/terrain. Hard to get lost with a detailed map that says "go here". 5) Don't compromise power during dust storm season. 6) What's the point of building in a lava tube, then build directly under the "skylight"? They had open sky above them, but inconvenience of being deep underground. But if sunlight can reach you, then so can solar radiation. They didn't have radiation protection of the lava tube roof, because they built where there was no roof. If you do that, then why not just stay on the surface? Their chosen location appears to have the worst of all options. In reality, there should be NO door to the outside w/o an airlock system. With an interlock system which would prevent the outer door from opening if the inner one were not sealed. Stupid is as stupid does. As you pointed out better compartmentalization would also help such a situation. Going back to fundamentals, the agronomist never would have passed a strict psychological profiling in the first place. A very strict "weed out the weak" program would have prevented the portrayed disaster, but it would have been too boring for TV. Its hard to believe time has passed so fast but its time for another series from the National Geographics. 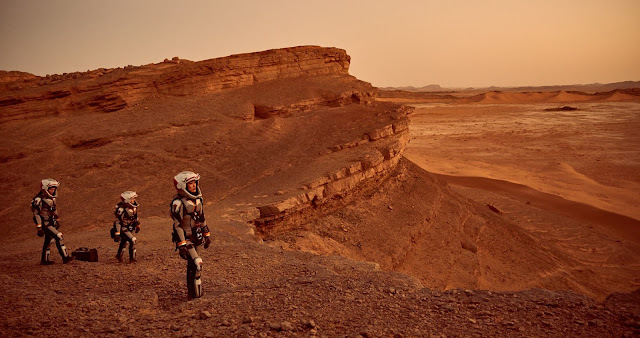 Watch the full season 2 episodes of National Geographic Channel's MARS TV series without the geographic restrictions here.